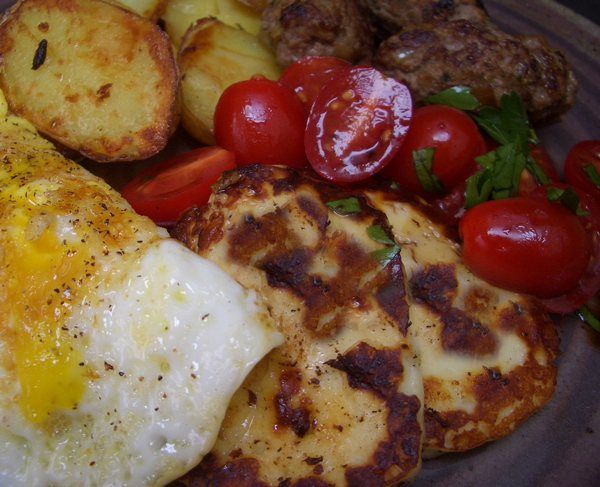 When I say “Greek” breakfast I just mean I’ve cooked everything in olive oil instead of butter. I’ve had eggs cooked in every kind of fat, and olive oil is my favorite. 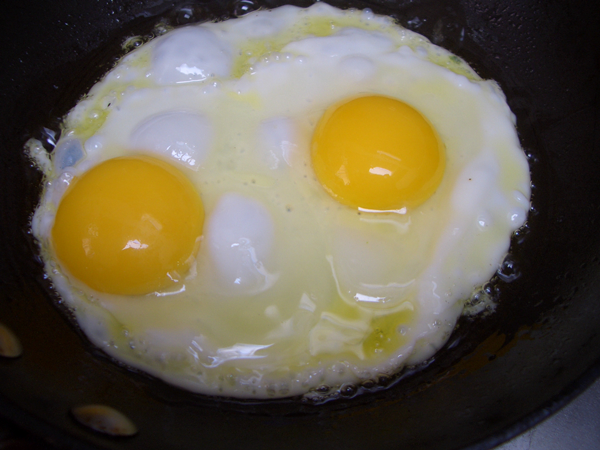 You can really pump up the heat–which would burn the butter–and the eggs get really crispy around the edges. The flavor of a nice olive oil doesn’t hurt. 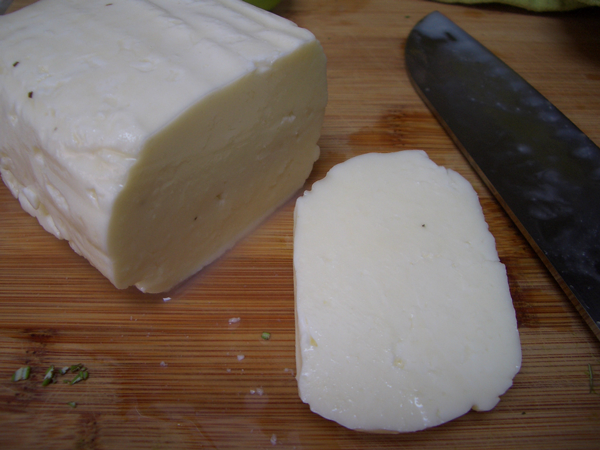 Halloumi is a soft sheep’s milk cheese flavored with mint and is widely available. Like Feta, it’s shaped into blocks and stored in brine and can last as long as three months in the refrigerator. I see it in every grocery store in San Francisco, not just the specialty markets with the intricate cheese sections. You might find it under the name Halloum, Halloumy or Haloumi. Eaten raw, it has a rubbery quality, but when grilled or pan fried it’s like a cross between cheese and bread– soft on the inside and crispy on the outside. It’s delicious and best right out of the pan. Plates in the oven on warm. I cook the potatoes first, and when they look like they’re almost there I turn the heat to warm and start the sausage. 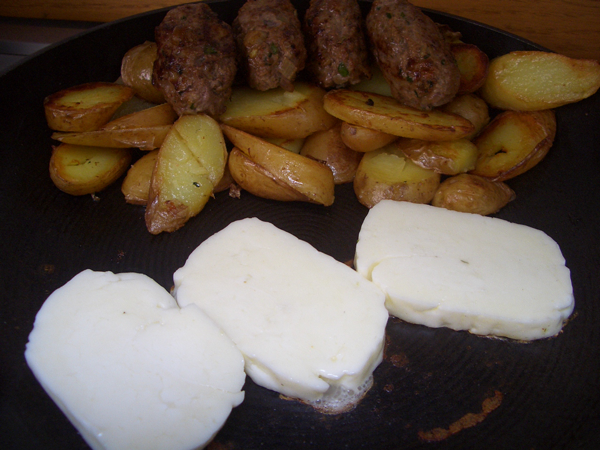 When the sausage are cooked, I move them to pan with the potatoes–if the flavors mix, all the better. I skootch both to the back of the pan and cover with foil. I turn the heat up a smidge, and in the front of the pan I cook the cheese. When I flip the cheese I start the eggs and call someone into the kitchen to help me start setting up the plates with the potatoes, sausage, and tomato salad. If I’m alone in the fight I distribute the sides myself, and put the plates back in the oven still on warm. Then I start the eggs. Fried eggs really need to be done individually. One by one, I transfer the eggs to the warm plates in the oven. Serve. You only need two frying pans if you clean the sausage pan after transferring them to the potato pan, in preparation for the eggs. I made this up based on what I had on hand, but you can add whatever flavorings you like. I cook the fennel beforehand so the licorice flavor isn’t as strong. 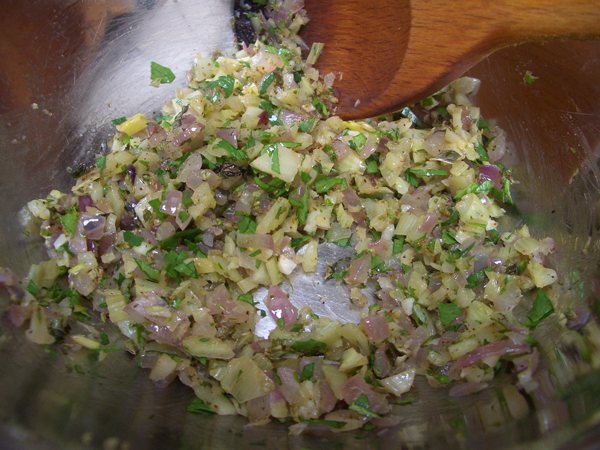 If you wanted a stronger flavor leave the fennel raw or add toasted fennel seed. I do recommend leaving in the lemon zest, it really made the sausage. In a little olive oil, over medium heat, cook the onion and fennel until soft and starting to turn golden, about ten minutes. Add the garlic and cook until fragrant, about 1 minute. Add the rosemary and oregano and cook another minute. Transfer to a bowl and let cool completely. Combine the cooled onion mixture, lamb, lemon zest, parsley and pepper in a bowl, and mix thoroughly–using your hands works best. 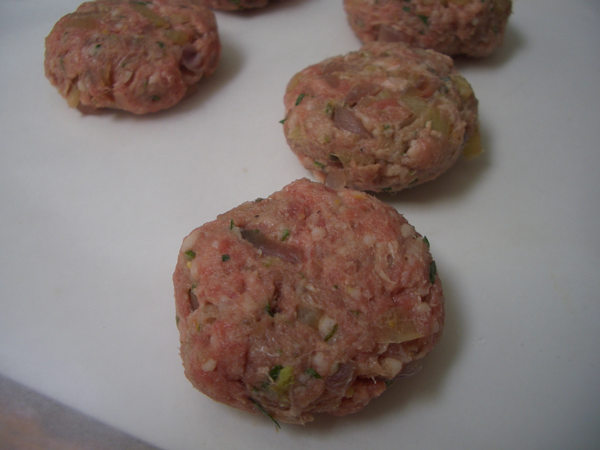 Form the mixture into small patties or rolls using about 2 tablespoons (30ml) per. At this point you can freeze the sausages you’re not going to cook right away. Heat a frying pan over medium heat. There’s no need to grease the pan. Add the sausages to the hot pan. Cook until brown on all sides. The potatoes in the photos are ruby fingerling potatoes. In general, use a waxy small potato, not a floury potato. Trim off any bad bits. 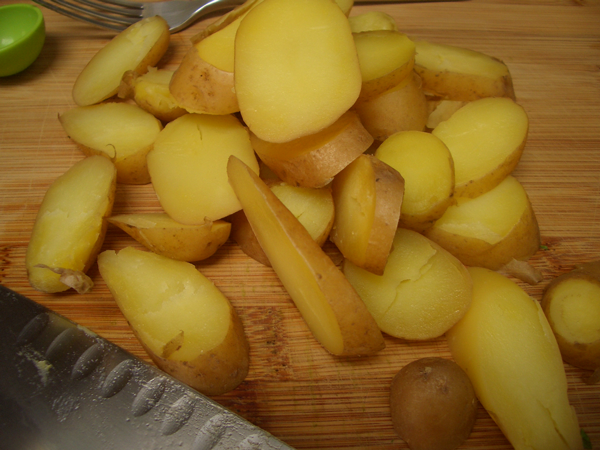 Wash but don’t dry the potatoes–you want the residual moisture on the skin. Prick any untrimmed potatoes with a fork. Put the potatoes in a microwave-safe bowl, cover and cook on high heat for 2 minutes. Microwaves vary greatly in terms of power so you might need to cook them longer. You want them to be slightly tender but not soft. If they’re still hard, cook them for another minute. Leave them covered to cool to the point you can handle them easily, then cut them on the diagonal into quarter inch slices. 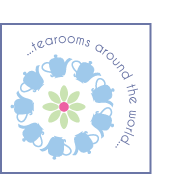 Use about 4 oz. (115g) of potatoes per person. Cook them on medium-high in olive oil until golden and crisp on the outside and cooked through. Sprinkle with a little sea salt (pepper if you like) and you’re done. The amount of olive oil you use depends on the potatoes. I used 8 oz. 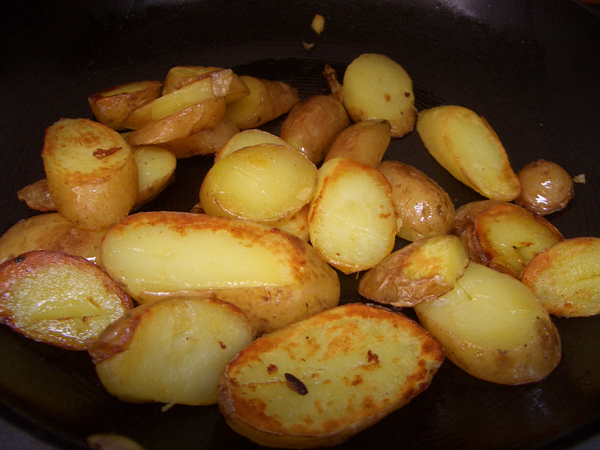 of potatoes and about 1 tablespoon (15ml) of olive oil. The texture of cooked Halloumi reminds me of bread so I think of this as standing in for toast. You can fry the cheese in oil but you don’t need to. It will cook just fine in the residual oil in the potato pan or in a dry pan. Cut the cheese into 1/2 inch slices. Allow 1-2 slices per person. The package size varies from brand to brand, but most I’ve seen would feed about four people. The amounts you use depend on how many people you’re serving. 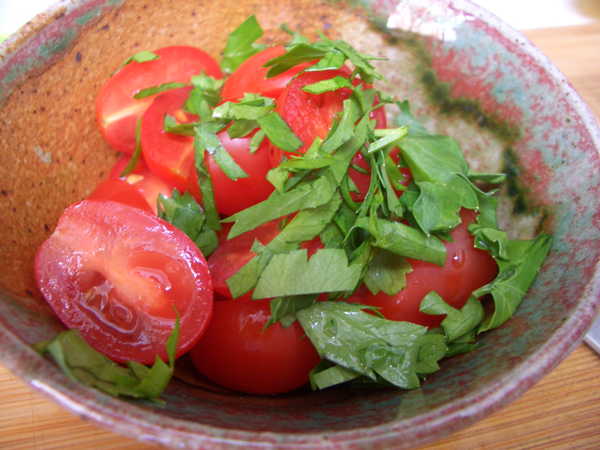 I would say about 5-6 tomatoes and 1 teaspoon (5ml) of parsley. This type of thing isn’t, nor does it need to be, an exact science. If you love parsley, use more. Splash on some balsamic and you’re done.